Do ya'll remember Rochelle's faux mercury glass pumpkins? 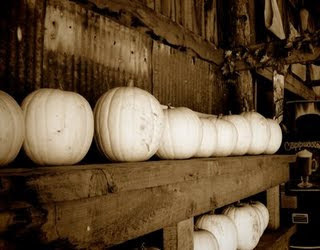 Well, ever since I saw them I have been trying to figure out how to copy this brilliant idea with real pumpkins. The other day I had a break-through. I worked at a florist for about 4 years in high school and college and we used floral spray paint to add color to flowers (and occasionally we did something horrendous like painting roses blue). Well, the wonderful thing about floral spray paint is that it's non-toxic and it allows the flowers to breathe, which means they will stay fresh for just about as long as normal. Well, I figured that if it works for flowers, it will probably work for pumpkins, too. I haven't displayed them all yet - I have another little project I want to complete before I arrange my fall decor. They look pretty good, if I do say so myself. Pretty realistic. I'll have to let ya'll know how long they last (hopefully through Thanksgiving!). P.S. 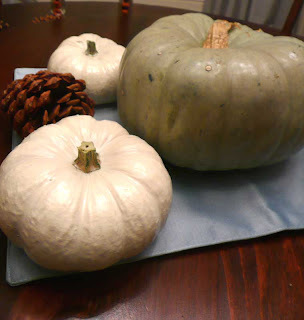 Did you notice my gorgeous gray pumpkin? It was sitting all by itself in Wal-Mart, begging me to buy it. I always see gray pumpkins in magazines, but I've never seen one in a store. I was so excited to find one! P.P.S. I just did some searching and you can find silver floral paint online if you want to do the mercury glass. Check here or here. I love the white pumpkin look. Your look fantastic. I will definitely try to copy! Never did see a gray one how cute is that? What a great idea! 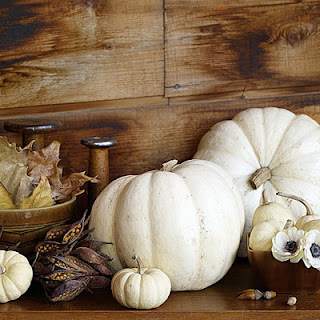 I love the look of the white pumpkins. I have been popping in once in a while to see what clever thing you have done and often file your ideas in the "I would like to try" file! 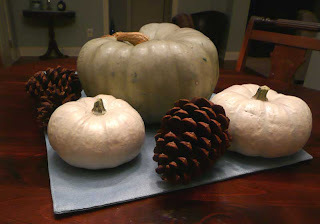 I do like the pumpkins, but I am about spray painted out this year, maybe next! 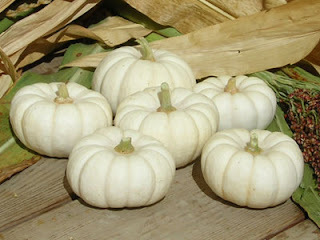 How pretty and what a wonderful idea, I just love pumpkins. I'm new to United States and loving all these pumpkin posts and pictures!! Thank you for stopping in, I enjoy your posts, so I will be popping in from time to time. I found you when you only had one or two posts up. Looks like you have been very busy! great idea!!! I really didn't know about that paint and now cant wait to get to michaels and start using them!! 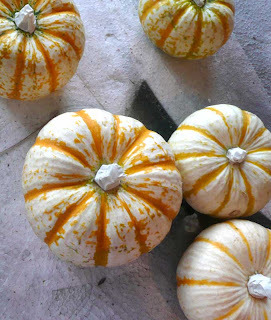 I am loving white pumpkins - never thought to paint real ones though. Thanks for the tip. I really love the gray one!